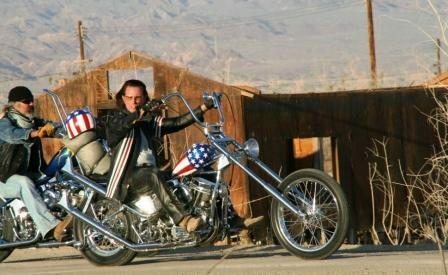 The Stars-and-Stripes-adorned “Captain America” chopper ridden by Peter Fonda in the classic American road movie Easy Rider crossed the auction block on October 18, 2014 and became the world’s most valuable motorcycle and the world’s most valuable film motorcycle at the same time. 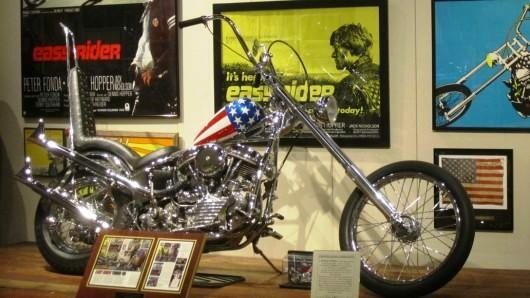 Arguably the world’s most famous and instantly recognizable motorcycle, the chopped Panhead Harley-Davidson played a central role in one of the American Film Institute’s top 100 movies of all-time, starring alongside Peter Fonda, Dennis Hopper and a young actor in his first major role, Jack Nicholson. The Panhead Harley began life as a Harley-Davidson FLH police bike used by the Los Angeles Police Department before being purchased second-hand and radically-modified for its film role – Harley-Davidson would not supply motorcycles for the film because of the “outlaw” motorcycle image it portrayed. There is some conjecture as to how many “Captain America” bikes were built from Harley FLH police bikes for the film.